Let’s be frank. Summer would be incomplete without the smell of hot dogs (or burgers) on the grill. They make a cheap meal when you’re having company, or when you’re feeling nostalgic, or at the ballpark, or the county fair, or walking down a New York City sidewalk…but after the tenth barbecue of the season, hot dogs just start to taste like salty rubber. World hot dog eating champion, Takeru Kobayashi, unofficially broke his own record yet again last month, consuming 69 dogs in 10 minutes. Talk about no longer savoring the sausage. Kobayashi probably doesn’t even know what a hot dog tastes like anymore. And if you’re still microwaving hot dogs and smothering them with ketchup, neither do you. So I set aside all prejudices against preservative-laden foods and boiled, grilled, baked, squirted, wrapped and fried some damn good dogs with five ingredients or less. I concocted four different versions for a taste test and the wiener (sorry I had to) was the light and refreshing Mediterranean-style dog. Alexia Detweiler is a freelance food writer based in Westlake Village, CA. While studying abroad in Brussels she became a beer and chocolate snob. Although she loves traveling, Alexia is an advocate for eating and shopping locally. Cook the hot dog any way you prefer: in the microwave, on the grill, on the stove, in a grill pan, in the oven. Specific cooking times will be on the hot dog packaging. Slice the baguette lengthwise like a sub roll. Toast in a 300 degree oven if you wish, being careful not to dry it out. Smear hummus onto the baguette. 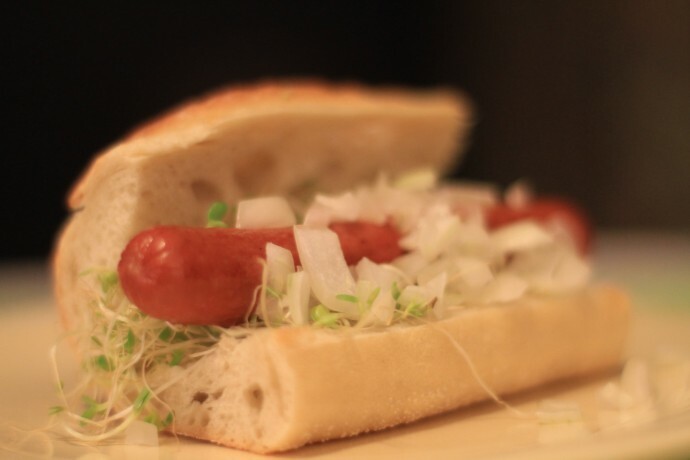 Pile on sprouts then add cooked hot dog. Garnish with chopped onions. Categories: Blog, Budget, Eating, Kitchen Course Catalog, and Recipes. Cooking Method: In the Microwave and On the Grill. I Don't Have Any: Cooking Skill, Space, and Time. I'm Cooking For...: Easy Dinner, Fourth of July, and Myself. Type of Food: Finger Food & Dips and Meat.